The Gospel ushers us into condemnation-free living. In right-standing with God, and the rich promises of Scripture ours, there is every reason for living life well. These few modern-day parables will help establish you in the good of the New Covenant. It is God’s will for you to live there with confidence and ease. Life is walking the high-wire, with Christ our safety net. We might slip and fall in the day-to-day, but we remain safely suspended in the lofty context of His victory. When we lose our footing, there is no inevitable devastating plunge to destruction. All there is to do is regain our equilibrium and get walking again. 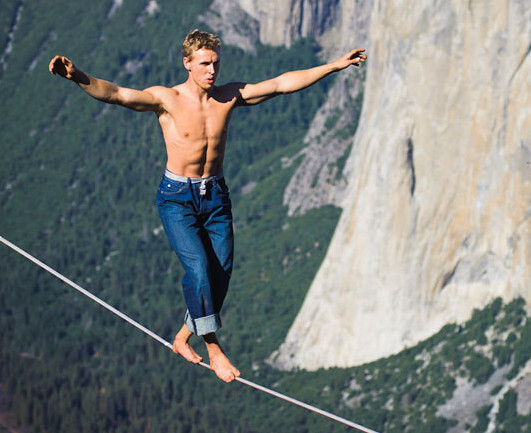 Consequently, we walk the tightrope confidently, without anxiety or fear, no matter how tetchy things might get on a wind-buffeted high-wire from time to time. Life is an innings at the crease with an umpire who will never give us out. The bales scatter; we’re not out. Caught playing the shot; not out. Plumb LBW; a shake of the head from the umpire. We can’t even be run out. That’s because every ball that life or the devil bowls at us in the cricket game of life has been rendered a no-ball by the cross. Every one remains a scoring opportunity, but none can take our wicket. Life is a ride on an up-escalator. The inexorable upward momentum of the life of Christ makes it well-nigh impossible for us to lose ground. Serious regression takes concerted, sustained effort, for He wills and works for our salvation at all times. We all stumble from time to time, but as we do, the escalator of His loving-kindness continues to carry us into our preferable future. In all things, He works for our good, even if the things themselves are not of Him, and not good. We can rest in Christ and enjoy the blessings and privileges that are ours by unmerited favour. Ours is the privileged life of the adopted child. The fact is that we are His four times over – He created us; He redeemed (purchased) us; We are born again of Him; and He adopted us. The adoption aspect of it all was transacted by grace in the moment of faith, and it means that we and all of our stuff are His! We have a new name, and it’s His. And so, on the giant school playground of life on earth, who’s your Daddy? No need to submit to the bullies of anxiety, fear, guilt, condemnation and shame, and no need to inflict them on others. Rather, we live secure in the family to which we’ve been added – the community of Father, Son, Holy Spirit and saints. I want to live for Jesus. I want to live life well. You do too, or else you wouldn’t bother reading this kind of post. Only those who have received the gift of His perfect righteousness can do that, because everything else falls short. But in Christ, that which we do in response to His love, is done in partnership with His perfection and under its banner. The result is ordinary men and women living lives to the glory of God, and doing so in the mundane of the daily, and at times doing extraordinary exploits.